Villa Las Palmeras is a Gorgeous 12 bedroom Villa with Spectacular Ocean and Old Town Views. Pricing starts at $1495 / Night for minimum of 6 rooms, each additional room is $139 per night. (Holiday pricing varies, as well as spring break season please inquire) Whether you book 6,7,8,9,10,11 or 12 rooms, the villa is always private for your group, the rooms you don't book remain vacant. VERY Conveniently located. Old Town, restaurant row and fabulous beaches are just a short walk. The Mallecon is connected to the beach near the villa. ALL BEDROOMS ARE ENCLOSED AND AIR CONDITIONED. The perfect location for any large gathering such as Weddings, Family reunions, Retreats, Birthdays.......Past guests rave about the staff and our chef's Guacamole was recently voted the best our guests found in all of Puerto Vallarta. The villa comes complete with large pool, top level bar, air conditioning, sound system with iPod hookups which play throughout the villa including the pool area and top level bar. The villa also has large flat screen TV with Cable. The Villa provides a houseman, daily maid service, 10 car parking. Cooking services are available for an additional charge of $100 per day. Tons of space for larger groups, this villa sits just above Old Town with sweeping views of charming Old Town and Banderas Bay. Everything you need is a short walk away. 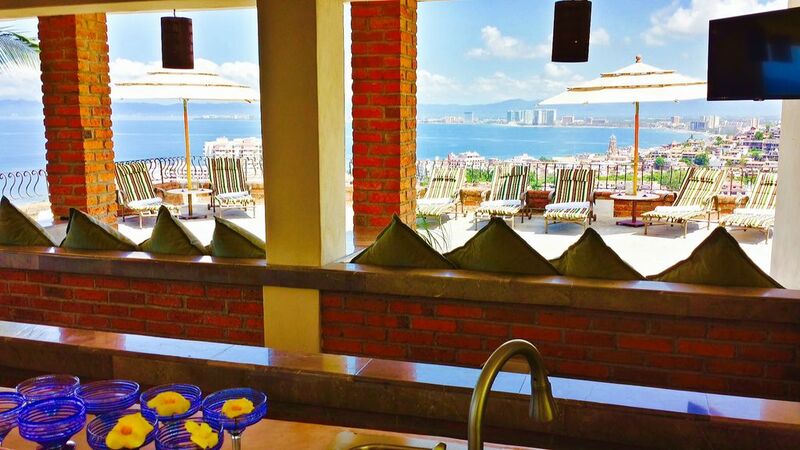 This property and the staff let you experience Puerto Vallarta the way it should be. 30,000 sq feet of wandering , lounging, and event space. Every detail was thought through. The top level deck overlooking the city and bay is large enough for wedding ceremonies, company retreats, yoga classes and more. It's an easy walk to beaches, shopping, restaurants, and nightlife. Chef and Bartender is $100 per day for two meal services. If outside guests attend weddings or events, this will incur additional fees. Cost of food and alcohol is additional to this fee. Our guests rave about how convenient our location is and how helpful the staff is. There are many activities nearby. The staff is happy to make suggestions and help with reservations and directions as well as calling for taxi's, reservations etc... The pier at the beach close by is a departure point for many boating excursions to the beaches only accessible by boat. Puerto Vallarta also known as the friendliest city in Mexico, is known for its exceptional quality food and culinary experiences, a "Foodies" paradise on the Bay of Banderas. A culmination of memorable tours can also be found, like ATV riding through the jungle, fire dancing shows at Las Caletas and tequila museum tours are just a few unique examples.